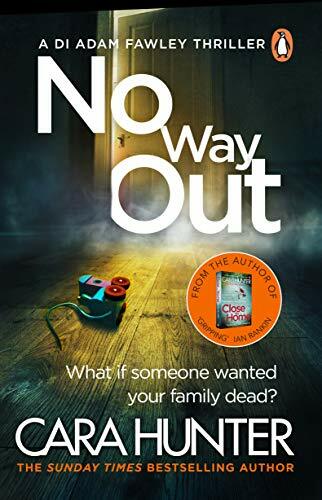 No Way Out is the third book in Cara Hunter's series of police procedural crime novels featuring Oxford's DI Adam Fawley and his team. Like its predecessors, No Way Out is a pacy, easy to read page-turner with a story that's pieced together from Adam's own first person narrative, third-person sections from the point of view of his colleagues, flashbacks to the victims and the build-up to their murders, and other material like news articles, social media posts and official reports, all of which combine to give the story a sense of gritty immediacy. After dealing with a missing child case in Close To Home and a Josef Fritzl-style abduction and imprisonment of a young woman in In The Dark, this time Fawley's team are investigating a case of arson. A fire has ripped through a large, affluent household, killing a mother, Samantha Esmond, and one of her children, Zachary, while her older son Matty fights for his life in hospital. Not only does the fire seem to have been set deliberately, but Michael Esmond, the children's father, is nowhere to be found. Is this a tragic but simple case of 'family annihilation', where a husband and father decides the only way to deal with the problems in his marriage is to wipe his family off the face of the Earth? Or is there something more complicated at play? Either way, it's up to Fawley to track down Michael Esmond and find out. I have a fairly strong record of being able to guess the outcome of whodunnits, but this one, teeming with red herrings, wasn't a case I was able to crack - always a good sign. The characters of Fawley's team and the relationships between them are fleshed out further in this third book in the series, and we see some of the fallout from a terrible mistake made by one of them in the previous novel. I find all the police officers in this series credible and, importantly, fallible. There's always a sense of how easily guesswork can lead the team down a blind alleyway, and how much of police work can hinge on sheer luck. If I have a criticism of No Way Out it's that, for some reason I can't quite put my finger on, I didn't quite engage with the victims and their families. It wasn't that they weren't convincing - they mostly were - but somehow I struggled to find Michael and Samantha Esmond particularly interesting. I wanted to know what had happened to them, but more in the spirit of completing a puzzle than because I really cared about the characters. Samantha, in particular, could have been a little more complex. This doesn't, however, detract from the fact that this is a well-crafted, absorbing murder mystery that, despite the twists and turns of its plot, actually feels surprisingly plausible.